EcoLan® is a latex-free, premium grade knitted bandage made with high quality yarn to provide superior support and compression. The non-latex component offers latex-sensitive patients an alternative to the latex rubber elastic bandage and can be worn comfortably without the risk of allergic reactions. Designed to be both user and patientfriendly, EcoLan® is quick and easy to apply. 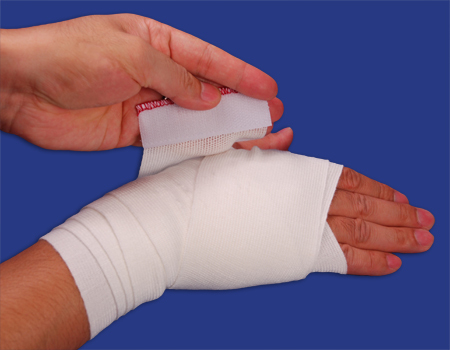 Its self-closure flap fastens anywhere on the bandage to hold it securely without pins, clips or tape. equires no pins, clips or tape. Self-closure flap allows for quick and easy use. Extremely versatile while providing consistent compression. For support, compression or securing. For use in the treatment of varicosities, sprains and torn ligaments. For use in Hospitals, Physician Offices, Industrial Health, Medical Clinics, Sports Medicine, Long Term Care, Home Health, School Health and Burn Units.